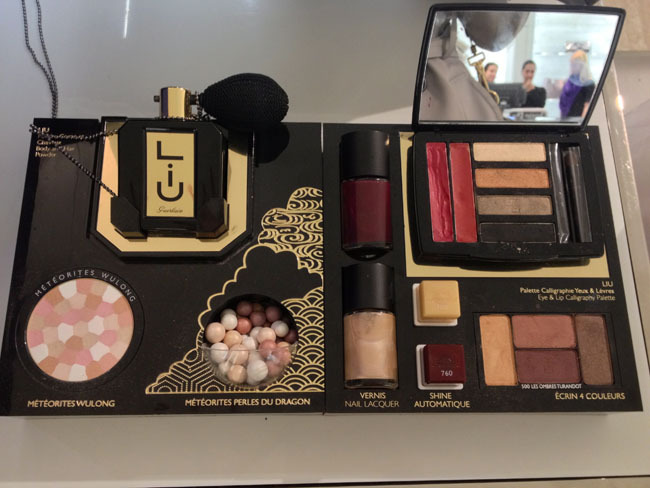 I was very tempted by the Liu Eye & Lip Calligraphy Palette, which surprised me because I don't like palettes that houses both lip and eye products. 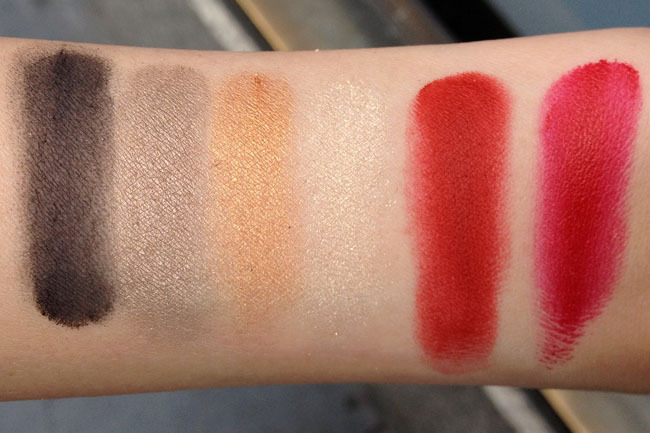 The three lighter eyeshadow shades are what I've come to expect from Guerlain - smooth, pigmented, exquisitely shimmery. The black shade is more on the matte side and thus didn't swatch as well, but eyeliner shades are usually that way. The standout, in my opinion, is the texture of the two reds in the palette. When I touched it it was actually smooth, as in it didn't feel like usual cream-type lipsticks. I imagine this would be how all those lip velvet formulas would feel if they were in pot form. The swatches were made using one finger swipe, and I know I said I shouldn't get any more reds, but just look at that. The Ecrin 4 Couleurs Eye Shadow in 500 Les Ombres Turandot is so, so beautiful, except I know I definitely won't be able to pull off such warm colors. I hope you can see the very layered swatch of the Meteorites Wulong on the left. 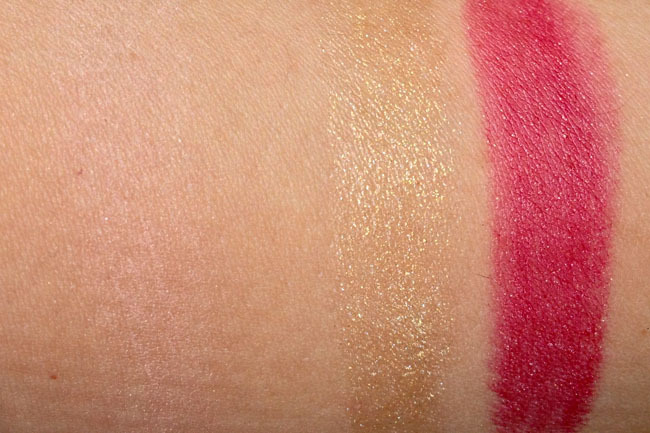 When swirled together, the powder is a pale, faintly shimmering pink. The two Shine Automatiques are quite sheer but can be layered for more intensity (do remember that Shine Automatiques are not made to be uber pigmented). Altoum is the perennial holiday gold, while Lou-Ling is a bright berry. Edit: I took down my swatch picture for the nail lacquers because of the ugly horrid smudge on Lou-Ling, as I personally would hate to see it on any blog myself. 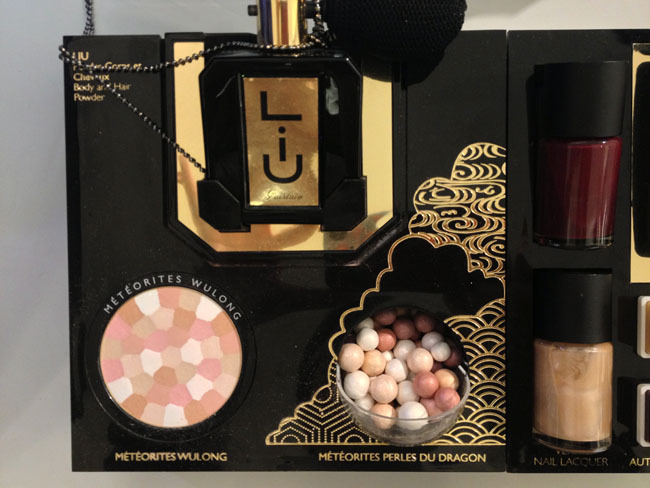 You can proceed to Temptalia's site for her review of both Altoum and Lou-Ling. I found the collection at Saks Fifth Avenue New York, which means it should reach Guerlain counters nationwide soon, if not already. I wish too! It's almost guaranteed that my eyeshadow will spill over, then it won't be pretty anymore either. I'm thinking if they put the brushes in the middle (although I don't think they should to include brushes) that would have been better functionally. 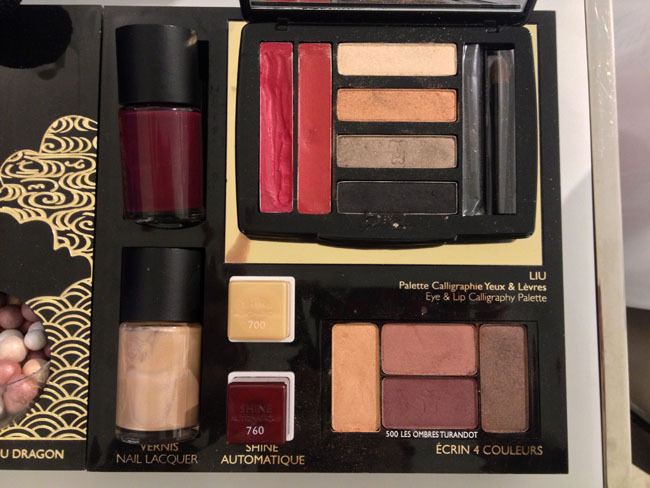 Oh, I am actually eyeing the Turandot 5 Coleur palette already! hehe. But I have warm skin, exactly same NC as Christine of Temptalia. Every single thing she says is good, just never ever failed me. And this palette is the one she wore for her wedding... So... haha, just have to get it. Then Turandot will look marvelous on you! That would be a practice for my patience, for sure :) Will you be getting anything? New meteorites always tempt me. I love the colors in this collection! 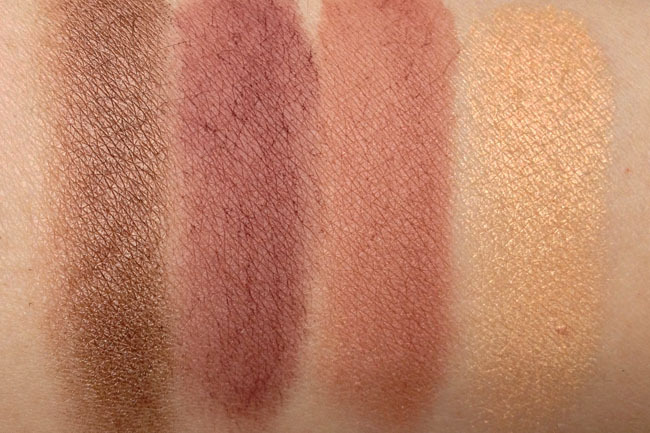 Also, I normally don't like bronzey shades, but I kind of really love the 4 Couleurs palette. Too bad they won't look good on my skin :(. me toooo, other half! I'm going to try it, but probably not buy. I have too many similar shades sitting around unused. Ok I need to visit Saks on my way home, that's it! i love the vampy red nail varnish. but i'm not sure i can spend that much on a colour i'm sure i can get from another, cheaper brand. do you find guerlain's nail varnishes exceptionally good? any alternative recommendations? I've never been particularly inclined to try their polishes, so I can't comment on quality. But yes, you definitely can find another from cheaper brands. I really want those Shine Automatiques and maybe the Meteorites. I can pass on the palette, and I'm too cool-toned for Turandot, but the lipsticks and the Meteorites are calling to me..
Jeez, I want everything except the nail polishes. With my hazel eyes, I think I could pull off Turandot. I've never been tempted by the Meteorites before...until Perles du Dragon that is. The packaging as well as the colors of the balls are SO beautiful!!! Wandz, I did not want the Calligraphy palette.... until I saw your swatches >.< I think a reservation is in order. I ADORE your blog! Honestly! I adore your style and the way you show everything and your reviews..everything! Would you like to follow each other? I already follow you..